Bored of your current wardrobe? 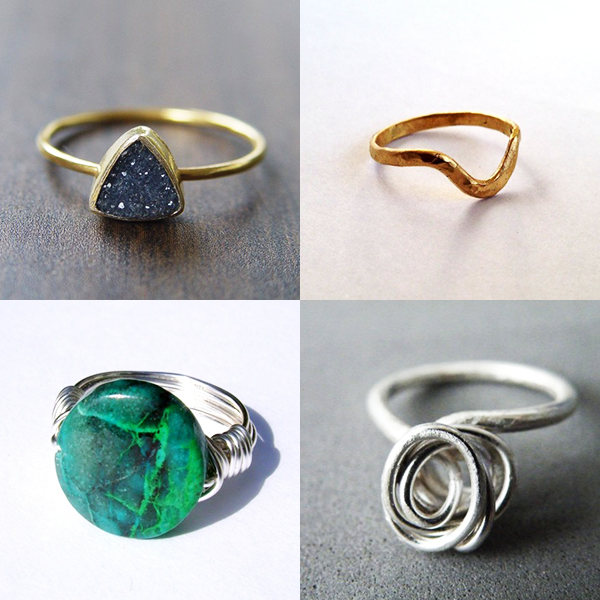 Why not add some unique, handcrafted rings that can bring a whole new look to and provide some much needed inspiration. Noir Triangle Druzy Ring, 14k Gold by Friedasophie - This beautiful noir black druzy gemstone features a subtle sparkle and pretty triangle cut shape. Set in 14k gold fill, this ring has a delicate hand forged band and is a perfect for everyday wear or as a statement piece. Triangle Ring by Firewhite - A little triangle chevron ring made from solid sterling silver. The V Shape is very eye catching and the hammered texture finish gives a lovely faceted effect. It would make a cute midi ring in a smaller size or could be stacked with other rings on the same finger for a unique look. The sterling silver used for comes from professionally recycled sources. The World to Me Ring by Shining Stones - This beautiful sterling silver wire wrapped ring is made from rare Matrix Jasper, which has gorgeous hues of deep blue and green. To me, this stone looks like the earth from space - hence the name The World To Me.